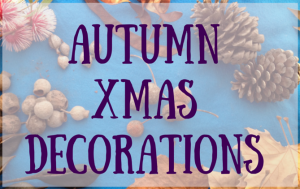 Christmas Decorations in Autumn (May) – What The !?! May is the final month of Autumn (Fall) in the Southern Hemisphere, and it can be such a glorious month. The sun is still warm, even though the days are cool. No more hot nights either. In my part of the world, we’ve already starting lighting our night fires. 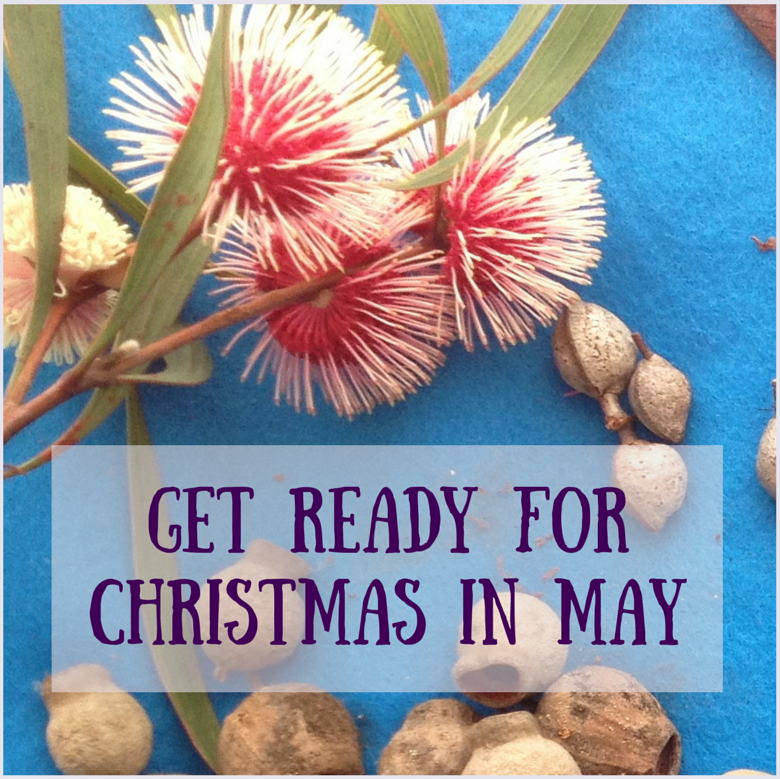 So if it’s only May, why am I even mentioning the word ‘Christmas’? Well, those of you with *short people* will know that you have many wet weekends ahead of us. Weekends when your children are more than likely to become ‘victims’ of boredom. SO I say . . .
2. get more organised for Christmas than you’ve ever been! All you need is ONE dry afternoon or morning, and you’re set. Give yourself one Saturday or Sunday morning/afternoon, set off from home with bottles of water and some homemade biscuits and take a drive. Leave the safety of your suburb and ‘go bush’ for a few hours. Even the busiest city is usually only two hours from native bushland. Perhaps even enlist one of children to do a GoogleMap search and find somewhere. Just a heads up – most National & State Parks (worldwide) don’t allow you to remove any flora, even nuts and seed pods – so instead, head to Reserves, Parklands and picnic locations. Or, you may have a great local park or even a backyard full of trees. Almost all the leaves, nuts & pods I have photographed are from my 900m2 house block, and only the pine cones are from roadside scavenging. So start looking upwards, keeping an eye on the potential in every tree and bush. After flowering, most trees produce pods or nuts that contain seeds – perfect to decorate and hang from your tree at Christmas time. Yet again – we’re going back to Mother Nature to do this step correctly. Although collecting your pods and nuts in plastic bags is convenient and practical, especially when they have to go back into the care to travel home – to store them is a different story. 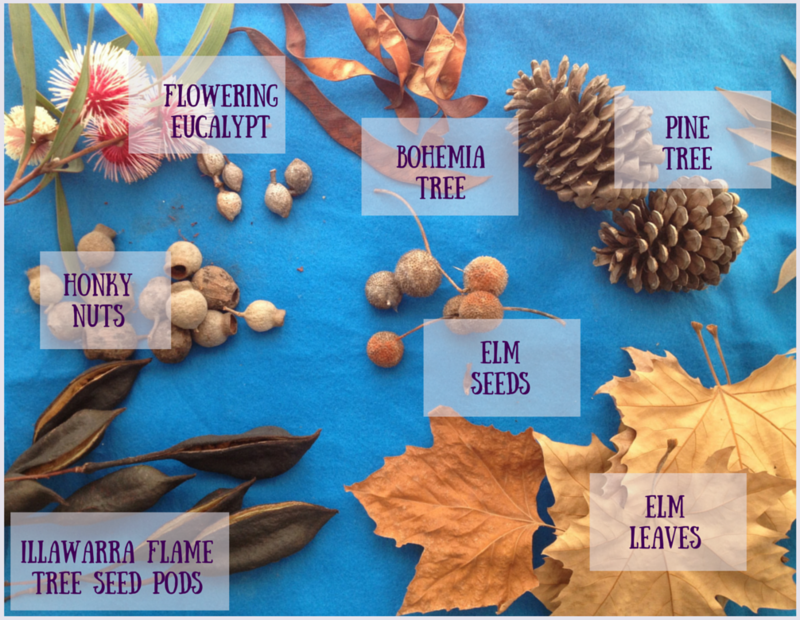 Regardless of how ‘dry’ these gifts from nature are when you collect them, they will in fact still have moisture within them. If you keep them in plastic bags, all you’ll end up with is a mouldy bag full of grot and possibly asthma in your family. So . . . . .
Have a couple of boxes and or paper bags waiting for you at home. Transfer nature’s booty into these bags/boxes, trying to only make the layers two deep. Don’t think you have paper bags or boxes? Not so. Lay your paper bags, boxes and old drawers in a North-facing window (Southern Hemisphere, remember!) 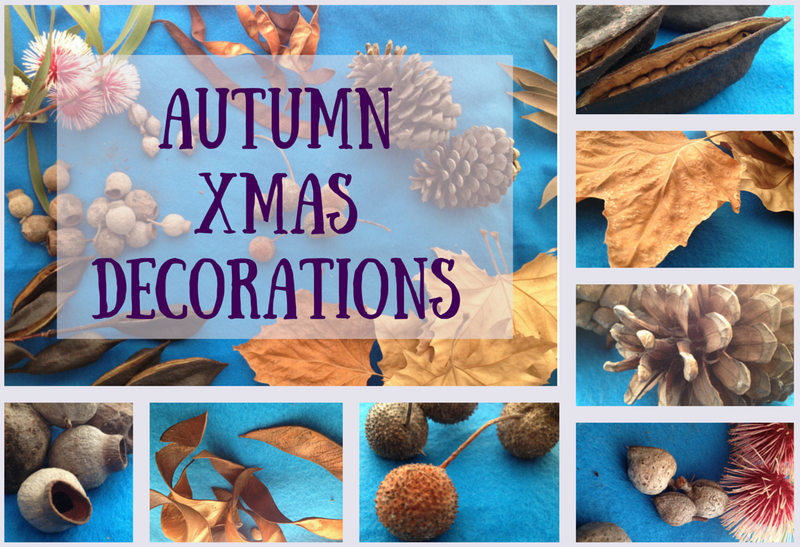 for a week or two ***, and your Christmas Decorations are ready to make fabulous. 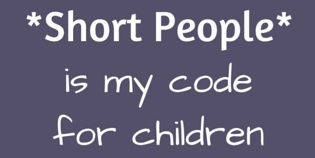 Generally speaking, *Short People* don’t need any guidance to be Creative. Just put the goods in front of them and let them go. But what if, dare I say it, you have a ‘theme’ or ‘colour’ in mind for this Christmas. I know that this attitude is generally poo-pooed in the blogosphere, but I don’t see anything wrong with it. I honestly believe it adds to the magic of Christmas when the parcels and bows, match the sparkles and baubles. In the coming weeks I will give you all the instructions you require to guide the Creativity of your children. Encouraging their own imaginations while steering them into the direction of your own colourful needs. *** You will know if your nuts are dry by doing this simple test. Leave it there for one sunny day. your pods and nuts need at least another week. Repeat this test after the week, until there is NO condensation on the bag!